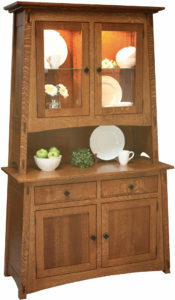 The Gettysburg Four Door Hutch offers plenty of storage space for all your dining accessory needs. Display your favorite dishes, serving ware, wine glasses, etc. on the beautiful glass shelves. Do you have several different size pieces? No problem. Each shelf is adjustable for exactly that reason. Additionally, you are going to love the butterfly inlays on the lower doors and the mullions on the glass doors. Even the trim at the top is detailed and will set it apart from so many other run of the mill hutches. If you like how you see it here be sure to order it in quartersawn white oak with Michael’s cherry finish. 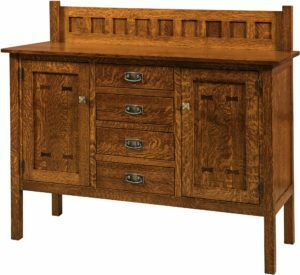 Contact us at Brandenberry Furniture in Shipshewana, Indiana. 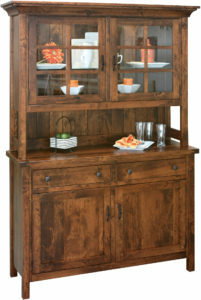 This Gettysburg Four Door Hutch is an excellent choice for your dining storage needs. Choose your options and request a quote: email, call, or visit us. We would love to help you select custom options and create a truly unique piece. Be sure to browse our dining tables, chairs, and other related products so you can complete the perfect look in your dining room.